Srikanth Reddy - SharePoint: The Three-State Workflow - The Forgotten Out-Of-The-Box Workflow for Both WSS and MOSS ! The Three-State Workflow - The Forgotten Out-Of-The-Box Workflow for Both WSS and MOSS ! Many people believe that MOSS comes with only four out-of-the-box workflows (Approval, Collect Feedback, Collect Signatures, and Disposition Approval), and that WSS v3 doesn't come with any out-of-the-box workflows. In actuality, there is another work flow that is available out-of-the-box to both WSS v3 and MOSS—it's called the Three-state workflow. 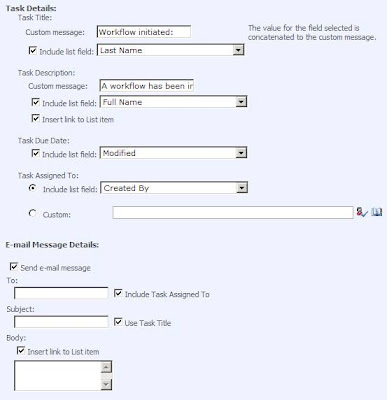 The reason that even many seasoned SharePoint professionals don't know much about the Three-state workflow is because the feature isn't activated by default—you will have to go into the Site collection features, and activate it. Once you have activated the Three-state workflow feature, it will be available as a workflow template to all your lists, libraries, and content types. The Three-state workflow allows you to track the status of an item between three states. This is very useful when tracking issues, project tasks, leads, or other similar items. I won't bore you with details on how to use it; Microsoft has already done an excellent job of explaining how to use the Three-state Workflow. My mission here is just to let you know that it exists. I will leave you with one small screenshot though, just to whet your appetite. Look at all the options you have for the task and email details for each transition step.